NEWS! 31.05.2009. NO MORE TRAFFIC JAMS! Traffic is released through both tubes of tunnels St. Rok and Mala Kapela. Tunnel St. Rok has 4 safety passages for vehicles and 15 for pedestrians. Tunnel Mala Kapela has 6 safety passages for vehicles and 14 for pedestrians. Speed limit through tunnels is 100 km/h. Also, there will be additional toll houses in Lučko so even there won`t be any traffic jams. Small traffic jams are posible only during high season, up to 7 km. 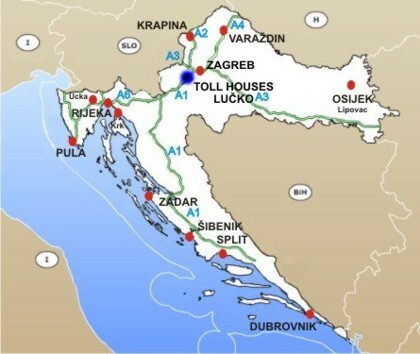 Please click here to view large map of HIGHWAYS IN CROATIA. Traffic jams are mostly on weekend, Friday and Sunday afternoon. We recommend that you go to your trip late night, early morning or working days.